.... where a picture is truly worth a thousand words. The Opera House (or Oprah's House at its being dubbed by some parts of the international media given this is where she will broadcast her shows at the end of the year). 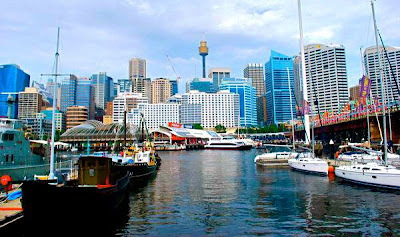 The beautiful backdrop of Sydney Harbour is used by all sorts of companies across the world for many different reasons. There's always something happening whenever you visit. IKEA, for example, was having some 3D fun at Sydney's Circular Quay to celebrate the 60th anniversary of the IKEA catalogue. The 3D chalk art was used to create an illusion of kids sitting in an enormous kitchen sink and mum balancing on the dish rack. A lot of fun for everyone passing by. By the time you read this post I will be home again...for a short while before some more travel. Life is changing and it's a very good thing after the past few years. Take Care everyone and I will catch up with you soon! O-M-G wish i lived there so PRETTY. Love all the photos. It brought back such lovely memories of our trip there. My photos were not nearly as spectacular as yours though. You do have a beautiful city! Can´t wait to hear about the changes. We miss you Lilly! Looks almost as nice as Chicago. Really it does have a great look to it's harbor. Thanks for sharing the pics. Have you ever climbed up on the bridge? It sounds like a fun tour. Love sidewalk art. I know I'm always asking you for comments on this or that but what happens is a post triggers another idea or past post and so I ask for your view. Blogging to me is a conversation. Wonderful photos, Lilly. Take care on your travels. A friend of ours met his wife in Sydney. They loved the area so much that when they had their first child, a baby girl, they named her Sydney. She's beautiful and so is the area! Sydney is one of my most favourite places to visit in the world. It reminds me of San Francisco. Lovely photos! I have lounged on Bondi Beach sand, saw a Tom Stoppard play at the Opera House (mid 80's), tried to walk back to my little hotel room in the King's Cross part of town and realized I needed to be in a taxi. I was only there one night, but I don't think I slept. I was on a budget, what can I say. Take care and stay happy. Wow, I didn't realize just how beautiful Sydney is. You take great shots, the city should hire you. Glad you are having the time of you life traveling. You deserve it. Enjoy it all. I have always wanted to visit Sydney. 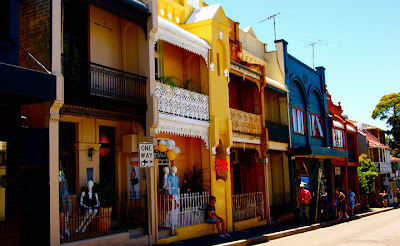 Have been to Melbourne for work but somehow have always missed getting to Sydney.Beautiful photos. Sydney is a beautiful city. I'd like to visit someday. I love the 3D artwork. That sort of thing always amazes me. The Harbour is beautiful especially given its right in the middle of the city. Mum I always said you should be a photographer. These are amazing. Yet we are also on the move, and I look forward to reading more about your changes, Lilly! Take care and cheers from Sydney. Wow Lilly-- Those are fantastic photos!!!! I've always wanted to visit Australia and this reminds me why. It's gorgeous. So glad to hear life is good. Safe travels my friend. me again - if you posted more often I wouldn't do multiple comments on the same post - but that's ok with me if it's ok with you. Just posted an Aussie/OZ/downunder story but I don't have an Aussie on my staff so if you don't mind could you or an Aussie mate of yours (do women call friends mates?) come by to verify the story. What a BEAUTIFUL City Sydney is.....! And especilly at night...! I love that the Opera House which is AMAZING looking is now being called Oprah's House...lol! Indeed. She is bringing her whole audience to Sydney....! What a fabulous trip and treat that will be. If the cost of a projector is a definite concern and you are unable to spend that kind of amount on it, you need not worry for there are other alternatives that can save your money and get you a projector. You can considerably choose the best Projector hire, instead of purchasing one.